Central Florida Speech and Hearing Center is seeking an enthusiastic speech-language pathologist with experience in adult acute care in a hospital setting and adult/pediatric outpatient care, to join our team. This is a full-time job opportunity. Candidates must demonstrate creativity, flexibility and interest in expanding programmatic initiatives. We are a non-profit, out-patient clinic specializing in speech-language therapy and audiology services. Working closely with families, we offer evaluation and therapy services to pediatric and adult populations. Our established staff welcomes applicants who are interested in being part of a dynamic future, being bilingual is a plus. We are experienced in mentoring CFY candidates and encourage their application. Have a hearing loss? This Wednesday, January 21st, FREE amplified phones will be distributed at the Sebring Public Library, 319 West Center Avenue, 10:30 am to 3 pm, no appointment necessary! 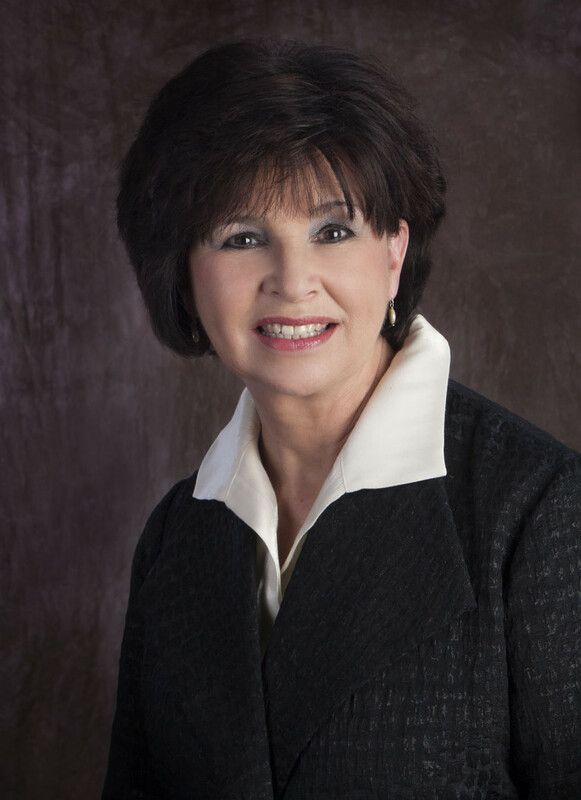 Central Florida Speech and Hearing Center promotes two to Vice President! Central Florida Speech and Hearing Center is proud to announce the promotions of Debbie Burdett to Vice President of Community Engagement and Robin Cole, COHC to Vice President of Operations and Human Resources. Hired by the Center in 2014, Burdett serves on several boards throughout Central Florida and is a graduate of both Leadership Bartow and Leadership Polk. 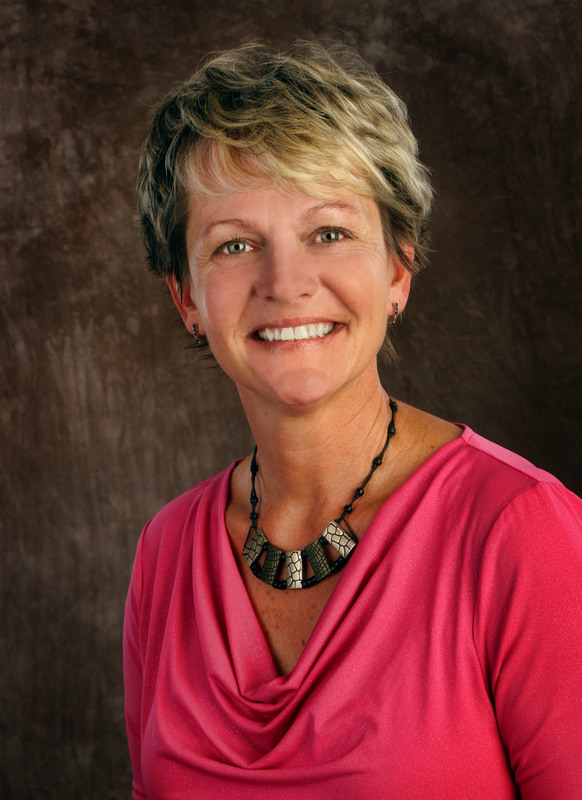 Cole has been employed with the Center for over 10 years working in several capacities within the organization, earning her certification as a Certified Occupational Hearing Conservationist in 2006. Receiving the 2007 Employee of the Year award, Cole continues to make a daily difference for the Center. 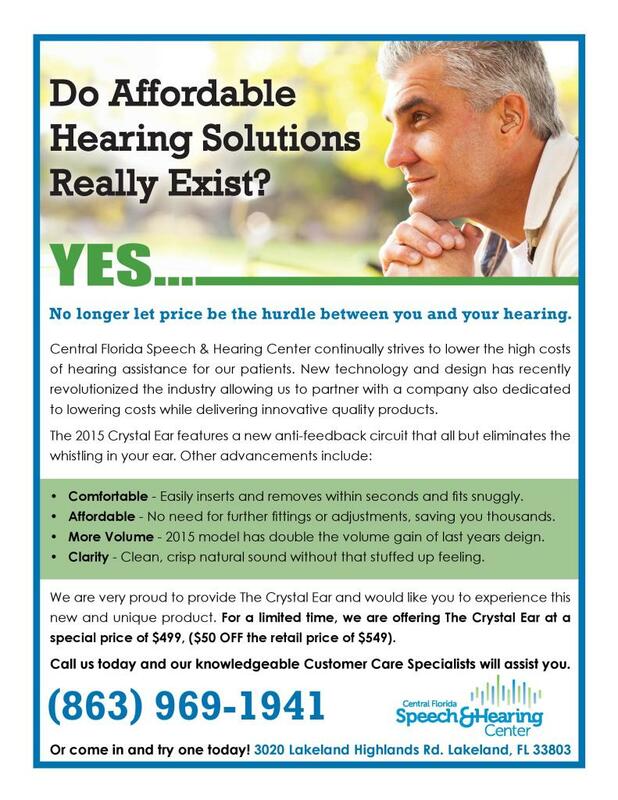 Central Florida Speech and Hearing Center continually strives to lower the costs of hearing assistance for our patients. New technology and design has recently revolutionized the industry allowing us to partner with a company also dedicated to lowering the costs while delivering innovative quality products. We are very proud to provide The Crystal Ear and would like you to experience this new and unique product! For a limited time, we are offering The Crystal Ear at a special price of $499. Call us today at (863)969-1941 or come into the Center and try one! Click here for more information and to view the flyer! Let’s have coffee and get connected! Learn more about hearing loss and the latest technology including wireless hearing aids, looping and more! 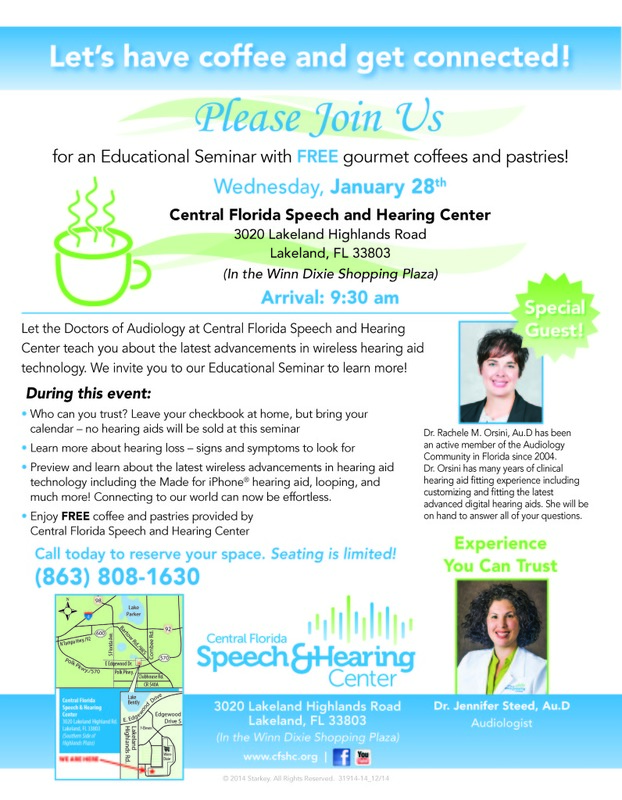 Featuring Dr. Jennifer Steed, a Central Florida Speech and Hearing Center Audiologist, and special guest, Dr. Rachele Orsini. Join Us for an educational seminar with free coffee and pastries on Wednesday, January 28th at 9:30 am. The event will take place at the Central Florida Speech and Hearing Center in Lakeland, Florida. Call 863.808.1630 today to reserve your space! We look forward to seeing you! Click here to view the flyer for the event. Watch Bay News 9 and the Ledger for a heartwarming story about one of our speech and audiology patients, Christopher! Bay News 9 sent out Rick Elmhorst and The Ledger sent Gary White. Both came with photographers and spent quite a bit of time here at the Center. They observed Danielle and Christopher in therapy and then watched him be elated with his gifts. This has truly been a community project. Christopher’s guardian, his Aunt, has fought to get him medical care and the other services he needs. It truly is wonderful to see that the Center was the nexus to bring all this together – the Center assisted with gas money so they can come from Frostproof for therapy, one of our Board Members donated the money to purchase an iPad mini with the app he needed to communicate and a waterproof case, toys were provided by Lakeland Margarita Society, and team members from the Center purchased a bike for him. This is a shining example of what happens at the Center. The more people that are aware of what we do, and come for services or make contributions, the more people’s lives will be changed! Thank you for your efforts and support!